Astrid models her latest design, the Afterparty jumper. It appears in Laine 6. We are thrilled to stock the lovely, lovely wool from the mother and daughter team of Biches & Bûches. From an atelier in Burgundy, Astrid Troland and her daughters, Caroline and Louise, weave a magic spell of colour and pattern that has captivated many knitters. The yarn is spun in Scottish mills before coming back to France for sale. Their wide colour range means Biches & Bûches is perfect for colourwork - and it’s at home in delicate shawls, or knit up into hats, cowls, mittens or jerseys. The range goes from fingerweight lambswool to a bulkier, Aran weight, with blends of lambswool and silk and lambswool and cashmere also on offer. We caught up with Astrid recently to hear more about how she got started on her Biches & Bûches journey and what might be next. Please tell us how you got started knitting, and about the work you were doing before you started Biches & Bûches? Where did you get the idea for Biches & Bûches, and how challenging was it to start a yarn company? Where did you find the link to your Scottish mill? As for many of us, it was my grandmother who taught me to knit. And to count. Those were the two most important things to know for a girl, in her opinion. I knit every day from when I was about five or six years old, and I was lucky to live in Denmark because school days are very short, so we had the whole afternoon off and could spend time doing sports, a lot of different activities and I would of course also be knitting a lot. I have always preferred knitting in wool and other natural qualities with a lot of beautiful colours. As for my education and working situation, I am a trained translator and I have had my own translation company for more than 20 years. For some time in the beginning, I worked in the south of France, but I soon realised that working away from home was difficult with two little girls so I decided to have my office in our apartment so I could take care of Louise and Caroline and still have a job. I was very lucky that this was possible. I actually still work as a translator, and I still enjoy it. The beginning of Biches & Bûches was long underway. It was back in 2012 that I started to think about and knit some designs and began writing patterns. Then I re-knit the designs and adjusted them so they were easier for others to knit. 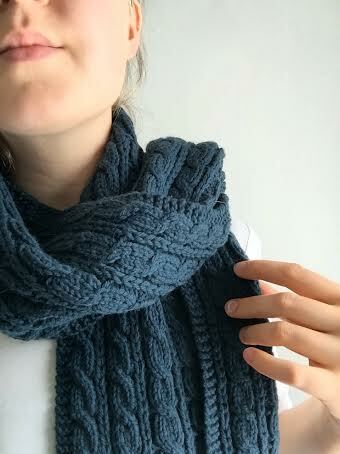 It is a different approach when you make a design just for yourself or if it is going to be published and understood by others, in different sizes, so I had to train myself to think about knitting in a whole new way. Slowly the idea of selling yarn and patterns took form, but it was only several years later that it really became a company. It was a big step to evolve from having a project I loved to start showing what I did to the world. So many ends had to come together to be able to sell my design ideas. It was very exciting, and it was absolutely fundamental to work with Caroline on this. She is young and has a different and more artistic background than I have, so she sees things differently. Caroline had just finished her studies to become a photographer when we spent a whole summer constructing the idea behind and the website for Biches & Bûches. Caroline is doing the writing, communication and the photos (except for the Instastories, where I mostly show my daily mood). For the yarn, I was sure that I wanted many colours. The original idea was to have some Norwegian wool, but it wasn’t possible so when I found our Le Petit Lambswool, I thought that it would be perfect for colourwork and my design ideas. It is a natural yarn, very easy to work with, and the quality of the yarn is very high. I’m still very happy with my choice and today, we have four yarn qualities: Le Petit Lambswool, Le Gros Lambswool, Le Cashmere & Lambswool, and Le Silk & Lambswool. When did you move to France, and what motivated you to make that change? Since I was a little girl, I have always been fascinated by France and everything French. When I was 18, I lived with a family in France for a year and I just loved the atmosphere, the way they lived and — shortly, I loved everything about it. I kept going back to this family whenever it was possible, and one summer on my way back to Copenhagen, Denmark, to continue my studies after a summer holiday break, I met my future husband, who is also Danish and who was working in France. It was an easy decision to make the move to Lyon. Caroline wears a Biches & Bûches colourwork jumper. How do you spend your days at the atelier? I still work as a translator, so I often begin my days with my translation work, just to wake up. Although these past months, I work more and more with Biches & Bûches. There are so many things to do, like taking photos, packing orders, working on new designs, planning the yarn production — the time just flies away when I’m with Biches & Bûches. And when I get tired, I sit down and knit — that’s my quiet moment of the day. At the atelier, we have a garden and we enjoy seeing the nature change, the birds growing up and other small and not so small animals around us. Life is very quiet here, and a good place to grow new ideas. What inspires you? And which do you enjoy the most - knitting, choosing colours, or designing? I think that everything can be an inspiration — a colour, a colour combination, the wool, the garden — it’s actually just a feeling inside you that you try to express through your work, so I feel that it’s a part of yourself that you show. It’s very personal, in fact. I love thinking about colours, trying out new colour combinations. I like to see how colours that I’m sure will fit perfectly together just don’t match well once they are knit. It has always amazed me that you cannot tell in advance what colours will work together in a certain stitch pattern and combination. That’s a fascinating thing about knitting. I’m someone who doesn’t really like to do things the same way twice, so when it comes to knitting, this is reflected in new ideas all the time. With the endless possibilities, I’d like to try out as many as I can — and this means many new designs. What is ahead for Biches & Bûches? We have a design (Afterparty) that was published in Laine Magazine issue 6 at the end of September and some new designs that we will launch in the coming months. We now work with many lovely yarn shops around the world (like yours in New Zealand) and that’s a very special way of connecting with new parts of the world and get to know some of all the lovely knitters that live far from us. And then we have different events: For example in September, we participated in Fanø Knit Festival in Denmark; in October we had an event in Paris called Tricot Market with a small group of knitting and yarn friends; and in November we will be at the big CSF - Création et Savoir-Faire show in Paris. So it’s a busy fall season. How important is it for you to be able to involve your daughters in this work? Our little family has always had the highest priority, perhaps because we live so far from where we grew up. We are very close, so it has been a great experience as a family with this project and of course, Biches & Bûches wouldn’t exist as it is if I were alone. To me, family is key. But, on the other hand, I want Louise and Caroline to pursue their dreams and find what inspires them and to go their own ways. So, over time, the structure of Biches & Bûches evolves according to the current situation and I think that’s great, because we need new inspiration all the time and trying out new things. They are both adults now — Louise is 30 and Caroline is 26. Finally, can you tell us about a favourite meal, or share a recipe? Nell Ziroli is a knitwear designer, knitting instructor, and all-around knitting inspiration. If you follow Mason-Dixon Knitting, you’ll see that she frequently pops up there with a wonderful, beautifully finished garment or an inspired take on a design that has captured a lot of attention. See, for example, the variant she made on Kate Davies’ wildly popular Carbeth jumper. Nell continued the ribbing from the cuffs up the arm, and the result of this simple change (which is complex to execute - ask how I know) made for a lovely variant on an instant classic pattern. In Mason-Dixon’s Lounge, where knitters gather virtually to talk turkey about patterns, design, and any challenges (oh, there are always plenty of those), Nell works tirelessly to provide tips and support. A lifelong knitter, Nell lives in American state of Virginia, where she shares a house with her youngest daughter. When she’s not working on her own projects, she finishes other people’s (I like to imagine her as a knitterly version of a country doctor), and regularly takes on an even trickier challenge - fixing treasured (but possibly over-loved) knitted dolls. You can find her patterns including the elegant Roger cardigan (an example of which is here) and her latest summer stripy design in linen (Liminal) and lots more on Ravelry and on her website. Tell us a bit about yourself: family, work, where you live, and the things you like to do when you’re not at work. Well, I’ve been knitting for over 50 years. 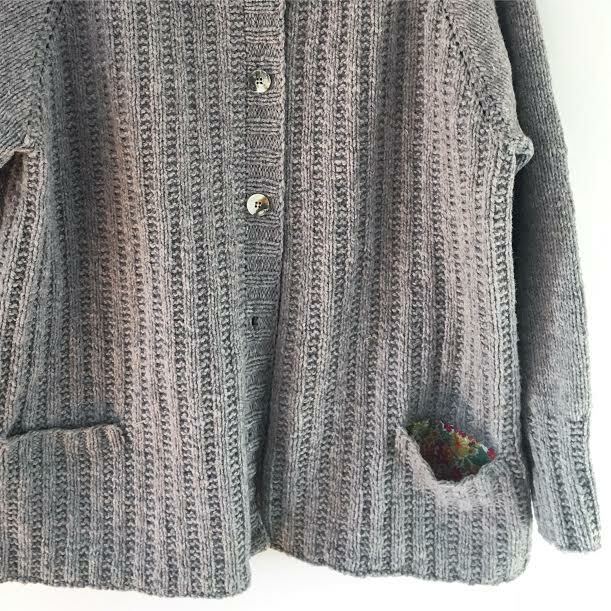 Details matter to Nell - like the Liberty fabric pocket she sewed into this Roger cardigan. Currently I live in coastal Virginia, and I have three beautiful daughters and two grandsons. My youngest daughter Haley and I still share a home. She is quite helpful with this work - she tests some of my patterns and has taught me all I know about photography. My middle daughter, Melissa, and her darling boys also live in Virginia, but still too many hours away. My oldest daughter, Christi, is way, way out on the West Coast. They’re all wonderful women who I’m very proud of. Walking is one of my favourite things to do - I love to keep an eye on what’s growing, who’s living in the trees, and I’m on the lookout for quirky architectural things. Tell us a little about your knitting - when did you learn, who taught you, favourite projects. What draws you to knitting? Why do you think it's important to keep practicing these skills? My mother taught me to knit when I was eight or so. Somehow, with all of the moves we made, she managed to save two of my early knitting projects - a cover for my Girl Scout “Sit-Upon”, made with Red Heart “Mexicana,” and a funky little drawstring bag. Actually my family is/was very creative. My grandfather was an architect, both grandmothers had various crafts going, and my dad built delicate balsa and tissue paper airplanes that he would fly. So I’ve always been surrounded by makers. In the ’70’s I had a pair of Levi’s cargo pants, which I fully embroidered, that I wish I’d kept - or at least documented. They were amazing. I can’t imagine not knitting. And this is a great time to be a knitter! There are so many temptations; choices in yarn and designs and not to mention technique! Do you do other work apart from NellKnits? Yes, I do! I have a part-time office job that is not at all related to knitting (however, knitting does occur there when it’s not busy). There’s also remote work for Mason-Dixon Knitting, moderating a few of their project forums and answering direct knitting questions. I work at my local yarn shop, Baa Baa Sheep, one day a week, and teach there a few times a week, too. I also do finishing, assembling, blocking and loving on other people’s work through the shop (and through the mail). Also, people send me Blabla knit animals to repair. Life is always interesting. What does the online world / social media bring to this creative party? Do you think it has helped to spark people's interests in what's possible? I love the connection of social media, the backstories, trials and triumphs and sometimes intimate views of people that you admire (hey, they’re just like me!) and I think that it may cause people to take a closer look at what is beautiful and interesting immediately around them. To be creative is such a strong desire and need for so many people, and although it may sometimes seem that there is a bombardment of ideas and projects, social media allows you to view many examples of a similar design or concept, which may allow you to make the best choice of how to proceed with it. Is there a possible downside in seeing too much "perfection" in people's feeds? (Over) curation - it’s preciously inspiring, yet frequently an impossible goal. That’s a tricky question. I think I’ll have to say that the amazing Baby Surprise Jacket is an architectural marvel to knit. Elizabeth Zimmerman would have been an incredible person to have spent some time with. The biggest trap is that students often think that they should get all of this now, and quickly. Keep it simple and pay attention to the details. I love little things that click and I appreciate symmetry. Finally, a note: When Nell generously agreed to answer our questions, we also asked her to share a recipe and to suggest other people who might be keen to share their stories with us. It’s a “recipe” (very bad pun) we’re hoping to make a regular feature here at Newtown House, so if you know someone you think would fit the bill, let us know at hello@newtownhouse.co.nz. I love to cook - meals are generally simple with minimal ingredients. However, I love these in every variation. Instructions: Stir dry ingredients together. Dry add-ins can be stirred in here. Cut or grate in butter. Pat into a circle, and cut into sixths or eighths. Or top with seasoned fruit, fold in half and pat again; cut into six wedges. Bake at 425 degrees F (220 degrees Celsius) for 12 - 15 minutes.